Barratt Developments has announced plans to build nearly 4,000 new homes in Scotland, following a series of land acquisitions. The housebuilder, whose brands include Barratt Homes and David Wilson Homes, aims to build 2,560 homes on 14 sites it purchased in the first half the year. It plans to buy another 10 sites this year for a further 1,415 homes. The overall total will include about 700 affordable properties. Barratt said it was in response to "continued growth in demand". The recently-acquired sites are spread around Scotland, including Inverness, Glasgow, Edinburgh, Aberdeen and Perth, as well as East Lothian, West Lothian, East Renfrewshire, North Lanarkshire and South Lanarkshire. Barratt hopes to start building on the new sites in the first half of next year, subject to planning approvals. 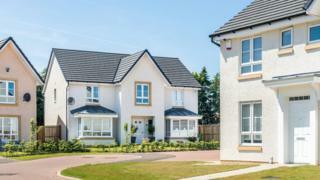 Douglas McLeod, the company's regional managing director for Scotland, said: "Demand for good-quality homes in Scotland shows no signs of slowing, in line with a steadily growing population. "For our part, we are continuing to invest in Scotland, acquiring new sites and building homes in popular places where people want to live. "The good news is that we're seeing an increase in the number of locations across Scotland which have become desirable places to live, helping to foster the growth of new communities while at the same time stimulating local economies."